Birreencorragh West Top is the 417th highest place in Ireland. Birreencorragh West Top is an unremarkable peak one km west of the main peak and only a short detour from the main circuit of the Glendorragha Valley. 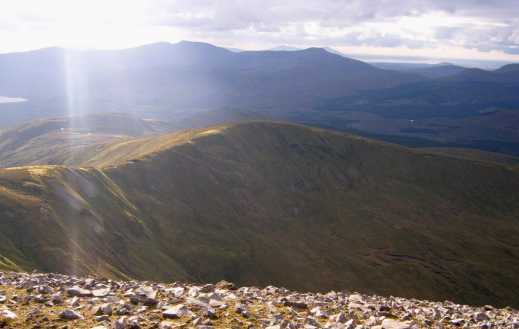 It has spectacular views of the north west face of Birreencoreragh. It will normally be climbed from the south and in conjunction with the main peak. The best approaches are from the Coillte forest at the mouth of the valley. There are parking places here, at G042 027 A A and G035 024 B B, a good way along forest tracks from the road. From the second of these spaces head north up a grassy rise towards sh336, west to Birreencorragh South Top and north to West Top, contouring around Birreencorragh itself.. It should take under 1.5hours to the top.